Web Owls » Blog Archive » Free website, anyone? For about a year now, I’ve been making use of the free web-hosting service offered by Microsoft called Office Live Basic. Most people have probably stopped reading already, as soon as they saw the name Microsoft. Truth be told, I can’t really blame you. Their free website tools, all ASP-based (don’t ask me what that means) are cumbersome, and definitely have a learning curve. But, you can register a domain name for nothing flat, build a site pretty quickly using their template construction methods, and — in time — pick up enough tricks to make the site look and function reasonably well. Pages work okay when viewed in Internet Explorer, but there are some problems with Firefox and other browswers. I’m just beginning to work out how to fix these. It’s possible (but not easy) to incorporate Adsense. Text ads work well, but image ads, for some reason, seem particularly non-relevant to the pages, and I’m eliminating their use bit by bit. There are limits to page formatting options with the free service. For instance, there are only a handful of fonts available. Anyway, just wanted to mention this, in case anyone feels like exploring a useful-but-not-perfect freebie for registering a domain name and quickly building a site. This entry was posted on Wednesday, October 31st, 2007 at 3:17 pm	by pafalafaga	and is filed under Discoveries. You can follow any responses to this entry through the RSS 2.0 feed. Both comments and pings are currently closed. When your site becomes famous, can you move it elsewhere or is the domain name stuck forever pointing to the Office Live Basic site? Good question. I believe it is transferable. At least I remember reading something to that effect back when I first got started, though I haven’t checked (or even thought about that) recently. And thanks for the links to the other free sites. 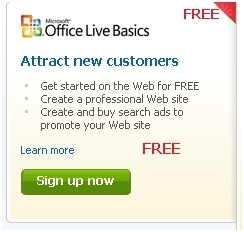 Two nice things about Office Live Basic: One, you get your own domain name (firstmention.com, rather than firstmention.wordpress.com), and two, there are no ads on the site (unless, of course, one puts them there intentionally). None of the sites I listed imposes their ads on you (although Blogger did in its early days). You can use your own domain name with Blogger, though you have to pay for it (less than $15 per year).